After a 733% one-day gain, a UPS and Goldman debut, can it get any bigger? NEW YORK (CNNfn) - Initial public offerings blew past every conceivable benchmark this year, setting records for first-day gains and amount of money raised. And, looking ahead, analysts say the ride isn�t over. Interesting stories abounded in 1999, when the phrase "going public� entered the language the way "junk bond� or "corporate raider� did a decade ago. Goldman Sachs (GS), the venerable investment bank formed during the Ulysses S. Grant administration, went public. Martha Stewart Living Omnicom (MSO), the arbiter of good taste, sold shares the same day the World Wrestling Federation (WWFE) offered stock. And United Parcel Service (UPS), the nation�s fourth-largest employer, became history�s biggest IPO, spurred by demand for a company that can profit from delivering goods bought on the Internet. 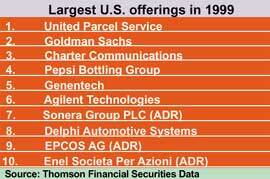 Initial public offerings raised more than $69 billion in 1999, 39 percent more than 1996, the second-biggest year, according to Thomson Financial Securities Data. More eye-popping, however, may be the year�s record first-day gains. VA Linux �(LNUX) jumped a record 733 percent in its first day of trading in early December. And VA Linux wasn�t alone. One hundred and seventeen, or 23 percent, of the year�s IPOs soared more than 100 percent in the first day of trading, according to WorldFinanceNet.com. The average first-day gains of 68 percent this year trounced last year�s average rise of 23 percent. "The number of (large) first-day gains has been beyond anything in our experience,� said Irv DeGraw, WorldFinanceNet.com�s senior research director. 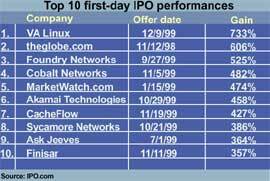 The year registered nine of the top 10 first-day IPO gains of all-time, according to IPO.com. But not all IPOs performed equally. Online retailers, many of which soared in their debuts last year, faltered this year as investors looked for companies with better profit potential. They found them in firms that build the Internet�s infrastructure and those that deal in business-to-business Internet services. Investors also clamored for anything with links to the Linux operating system, seen as a threat to Microsoft�s (MSFT) Windows NT. In contrast, companies such as Freemarkets (FMKT), Sycamore Networks (SCMR) and Foundry Networks (FDRY) -- all business-to-business e-commerce firms or Internet infrastructure companies -- rose strongly in their debuts. Moreover, they continue to hold those gains. Foundry has jumped nearly 1,200 percent since going public. When it came to first-day performance, the underwriter mattered. Morgan Stanley Dean Witter �(MWD) proved it. More than 50 percent of the big brokerage�s deals gained more than 100 percent in the first day of trading, according the WorldFinanceNet.com. Credit Suisse First Boston� and Robertson Stephens both had about 40 percent of their deals reach the same milestone. Goldman Sachs, which led all underwriters with $15.7 billion in deals, was fourth with an average 35.8 percent first-day gain for its IPOs. The IPO calendar already is packed for January, a sign that analysts say points to another solid year. Companies� need for stock to make acquisitions will not go away. Nor will the need to have stock to attract talented employees. Stock options are an increasingly common form of compensation, particularly among tech firms. "I don�t see the pace slowing down because there is a lot of available capital in the market,� said Alert-IPO!�s Ostman. But WorldFinanceNet.com�s DeGraw said he doesn�t expect another record year in terms of money raised. "We�ve never had back-to-back records before,� he said. A UPS, or a Goldman Sachs, DeGraw notes, doesn�t come along everyday. Still, next year does contain a few blue chip debuts. Metropolitan Life, the big insurer, and John Hancock, the Boston financial services firm, both plan to sell shares to the public. DeGraw sees more Linux frenzy next year. He also forecasts the emergence of the gene-mapping firms, as investors clamor for a piece of the latest in medical developments. He also sees more debuts by set-top box makers, like OpenTV (OPTV), which are poised to benefit as Internet delivery moves from the PC to the television set. IPO.com�s Hirshkorn, meanwhile, sees the year ahead in IPOs tied to the fate of the Nasdaq, up more than 80 percent this year prior to Monday�s trading. One early indicator looks promising. Ralph Acampora, the well-known chief technical analyst at Prudential Securities, said the Nasdaq should smash the 5,000 mark next year.